This is the website of Owen Barder, a development economist. 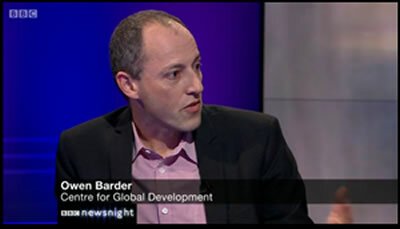 Owen is Director for Europe at the Center for Global Development and a Visiting Professor in Practice at the LSE. Owen was a civil servant for a quarter of a century, working in Number 10, the Treasury and the Department for International Development. Owen hosts the Development Drums podcast, and is the author Running for Fitness, the book and website. David Mepham, who died this week, has a strong claim to be the person who did most to bring about the establishment of the UK’s Department for International Development. Donors are considering a proposal for a new “innovative finance mechanism” to increase funding for education, based on recommendations from Gordon Brown’s Education Commission. We agree that we need to finance an expansion of education in the developing world. But sadly, the International Finance Facility for Education (IFFEd) proposal is too good to be true. A list of announcements that for the first time in history we can eradicate poverty. Theresa May says that citizens’ rights are her first priority. She means that her first priority is to curtail them. This is a good round-up of the rights that EU citizens living in the UK seem likely to lose, notwithstanding the government’s protestations that their rights will be largely unchanged. I list them here, but they are better explained in the article. The right to go abroad The right to fall in love with a … Continue reading What rights will EU citizens in the UK lose?